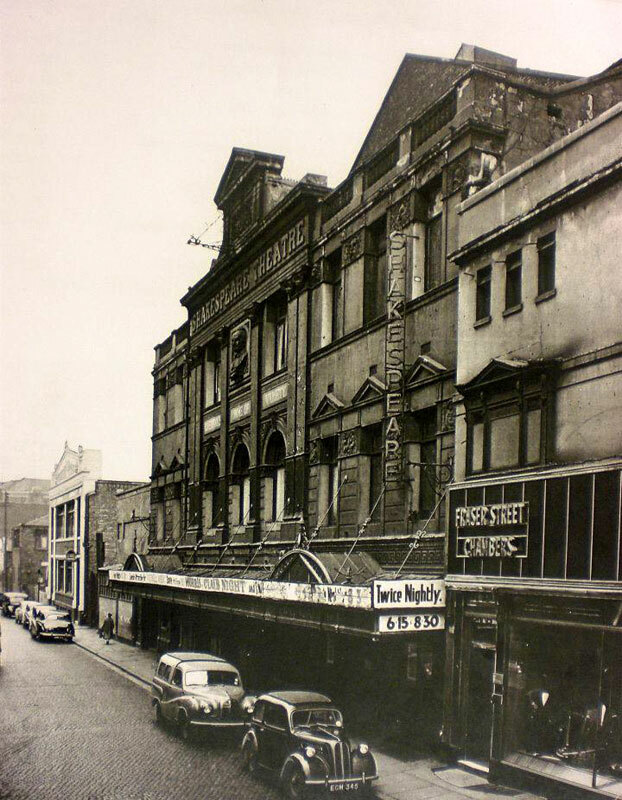 Charles Mortimer was in the cast of "Diplomacy" at the Prince's Theatre, Bristol, left, and the Shakespeare Theatre, Liverpool, right. 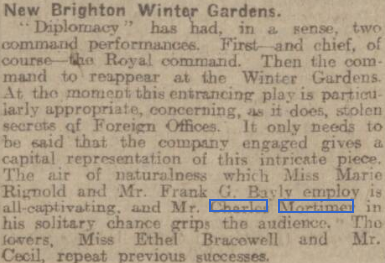 The play was also to be seen at the Winter Gardens, New Brighton, in November,1915. From The Era of 28 July, 1915. Interesting to note the quick change of company. 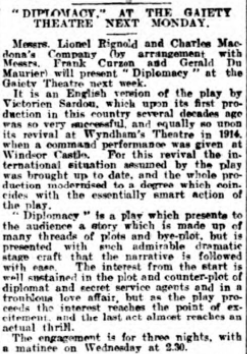 The production of "Diplomacy" at Wyndham's Theatre, London, from 26 March to 18 April, 1914, had Arthur Wontner playing "Count Orloff". Arthur and Charles were to later join together in the cast for the film, "The Triumph of Sherlock Holmes" in 1935, Wontner playing Holmes, and Mortimer playing Inspector Lestrade. 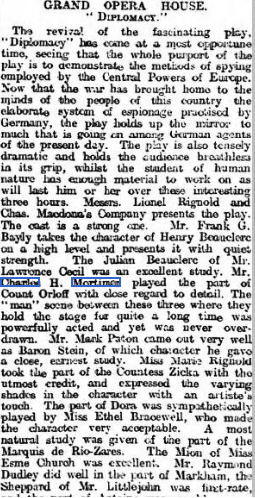 "Charles Mortimer, in his solitary chance, grips the audience". Taken from the Liverpool Echo on the 9th, November, 1915. 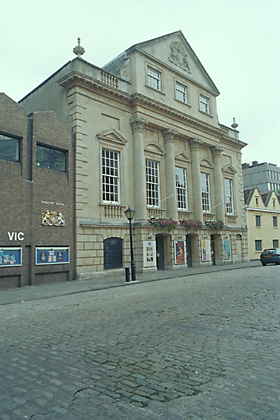 The article commented that the play had given a Royal Command performance. 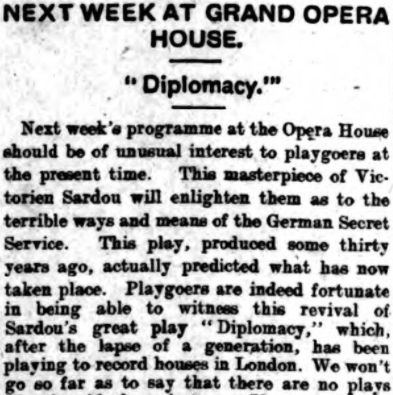 According to the Western Daily Press of 17 August, 1915, the play was "played by Royal Command at Windsor before the King and Queen." It also quoted that "Count Orloff is made a manly and chivalrous figure by Mr Charles H Mortimer." From The Era of 18 August, 1915. Licensee. Mr. James Macready Chute; M.D Mrs Chute and John Hart: RM.&T.. Mr. T. Ellis Miller Mus. 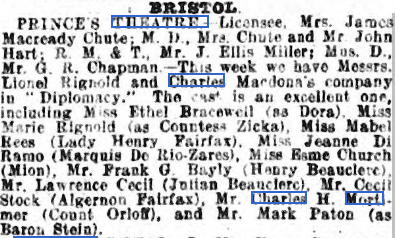 D., Mr.GR Chapman —This week we have Messrs. Lionel and Charles' company in "Diplomacy". 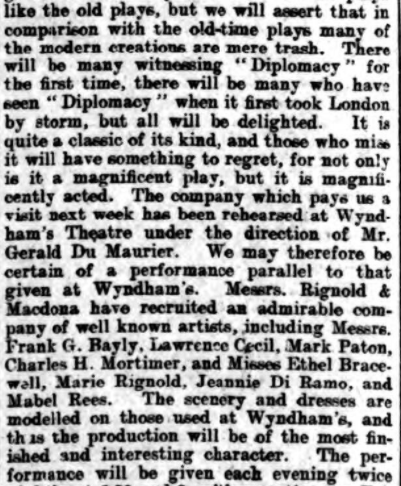 The cast is an excellent one, including Ethel Bracewell (as Dora) Miss Marie Rlgnold (as Countess Zicka), Miss Mabel Rees (as Lady Henry Fairfax). Miss Jeanne Di Ramo (as Marquis de Rlo-Zares), Miss Esme Church (as Mion), Mr Frank Bayly (Henry Beauclerc). Mr. Lawrence Cecil (Julian Beauclerc), Mr. Cecil Stock fAlgernon Fairfax), Charles H. Mortimer (Count Orloff), and Mr. Mark Baton (as Baron Stein). 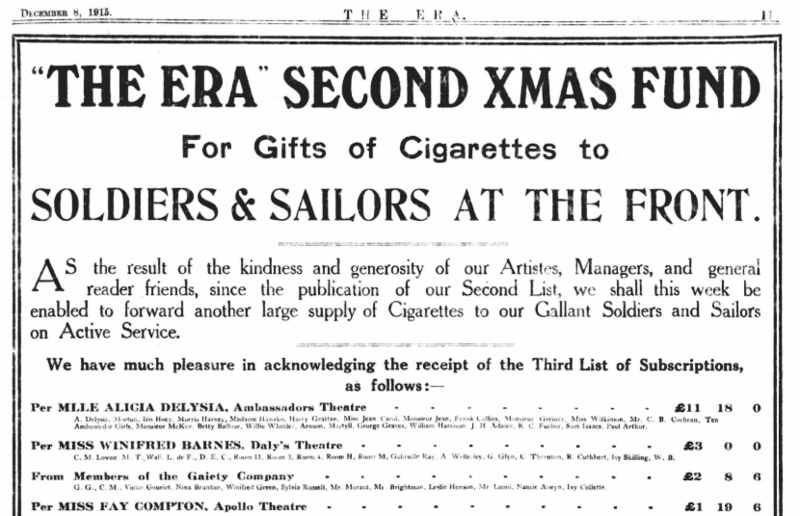 According to the Era of 8 December, 1915, the cast of Diplomacy raised 17s 6d towards a supply of cigarettes for soldiers and sailors. Diplomacy & Co, Ethel Bracewell, Cecil de Lee, Marie Rignold, Charles H. Mortimer, Madam Ramo, Frank G. Bayly. F. Pennington Gush, Cecil Stock, Esme P. Church, M. Rees, Mark Baton. From The Northern Whig of 6 August, 1915. Taken from The Era of 8 December, 1915. Charles Mortimer was appearing in Diplomacy, and donations were collected to send items to the Western Front in World War 1. From The Stage of 9 December, 1915.